Major General John Sedgwick was the highest ranking Union general killed during the Civil War. 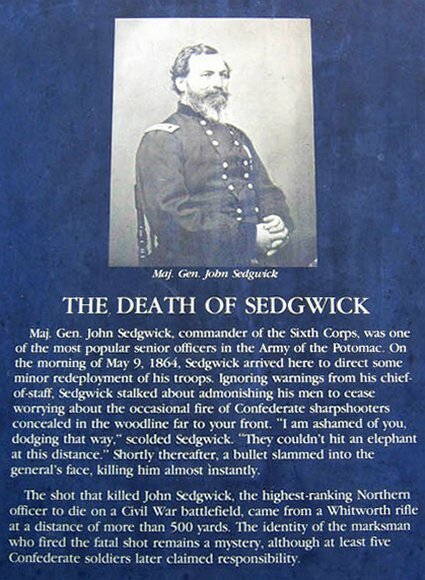 While astride his horse and chiding his men for flinching at the sounds of Confederate sharpshooters who were some 1,000 yards distance, Sedgwick said that "they couldn't hit an elephant at this distance," only to be struck instantaneously under his left eye causing the commander to fall lifeless to the earth. The kill shot was made by a Confederate using the Whitworth rifle at a debatable distance of 700 yards. The loss in officers killed or wounded, in proportion to their number, was in excess of that of their men. Of the total number killed and wounded during the war, there were 6,365 officers, and 103,705 enlisted men; or, one officer to 16 men. In the common regimental organization there was one officer to 28 men; and this proportion would have consequently required only one officer to 28 men among the killed. The loss of officers, however, was not so excessive as the difference in these ratios would indicate; for, as the ranks became depleted the latter proportion was not maintained. In the Army of the Potomac, just before starting on the Wilderness campaign, the morning reports showed one officer to every 21 men "present for duty, equipped." As this latter proportion was a frequent one, it may be assumed that the difference between it and the actual ratio in the killed indicates fairly the excess of the loss in officers. At Gettysburg, the officers lost 27 per cent. in killed and wounded, while the enlisted men lost 21 per cent.,-- as based on the number engaged. At Shiloh, the loss in officers killed and wounded was 21.3 per cent., and in men 17.9 per cent.,-- as based on the morning reports of Grant's six divisions. This greater loss among the officers did not occur because they were so much braver than the men in the ranks, but because the duties of their position while under fire involved a greater personal exposure. Sharpshooters were always on the alert to pick them off; and, even in the confusion of a hot musketry fire, any soldier, no matter how poor a marksman, would turn his rifle on any conspicuous man in the opposing ranks whose appearance indicated that he might be an officer. In close quarters, guns were not apt to be aimed at privates if a Lieutenant was in sight near by. There was just as good stuff in the ranks as in the line; in fact, the line officers were recruited almost entirely from the ranks; but when the gallant private donned an officer's uniform, he found his chances not at all improved, to say the least. This additional exposure is well illustrated by a comparison of the casualties at Gettysburg with those of the Wilderness. In the first named battle the percentage of loss among the officers was one-half greater than in the latter. At Gettysburg, the fighting was done in open fields, where the officers were in full view; at the Wilderness, the fighting was done in dense thickets which concealed the opposing armies. In the latter, both officers and men were hidden by the leafy screens, and hence their casualty lists show a like percentage of loss. In the Franco-Prussian war there was a remarkable excess of loss among the German officers. The percentages of killed and mortally wounded in the entire German army were: Enlisted men, 3.1; Line officers, 8.0; Staff officers, 9.6. The largest number of officers killed in any infantry regiment in the Union Armies is found in the Sixty-first Pennsylvania, of the Sixth Corps, in which 19 officers were killed or mortally wounded during the war. Among the number were three colonels: Col. Rippey was killed at Fair Oaks; Col. Spear fell while leading a successful assault on Marye's Heights; and Col. Crosby, who had lost an arm at Fort Stevens, was killed in the final and victorious assault on Petersburg. The total loss of the Sixty-first in killed and died of wounds, was 19 officers and 218 enlisted men; total, 237. It was a gallant regiment and was bravely led, as its loss in officers clearly shows. A heavy artillery regiment had just twice as many line officers as an infantry regiment. The largest regimental loss of officers killed in any one battle, occurred in the Seventh New Hampshire at the assault on Fort Wagner, the regiment losing 11 officers killed or mortally wounded in that bloody affair. Among the killed was Col. Putnam, who fell after he had gained an entrance within the outer works of the fort. He was a graduate of West Point and an officer of the Regular Army; like many other Regular officers he had received permission to accept the command of a volunteer regiment. The Twenty-second New York Infantry lost at Manassas 19 officers killed and wounded out of 24 present in action; 9 of them were killed, among whom was the Lieutenant-Colonel, Gorton T. Thomas. In addition, mention should be made of the loss of officers in the heavy artillery at certain battles. The First Maine H. A. lost 12 officers, killed or wounded, at Spotsylvania, May 19th, of whom 6 were killed or mortally wounded; and at Petersburg, June 18th, the same regiment lost 32 officers, killed or wounded, of whom 10 lost their lives. In the Eighth New York Heavy Artillery, 9 officers were killed at Cold Harbor. But the large number of extra officers allowed these regiments will not admit of their classification with the infantry regiments just mentioned. There is a remarkable difference between the loss of officers in battle and by disease, as compared with that of the enlisted men. In battle, one officer was killed for every 16 enlisted men; but, among the deaths from disease, one officer died to every 72 men, and in the colored regiments, one officer to every 215 men. The officers had better facilities for purchasing food, and were furnished with better quarters while in camp; but in an active campaign, in bivouac or on the march, they encountered substantially the same exposure and privation; they were exposed to the same storms and their food was equally scanty. There was not enough of difference in the fare to account for this remarkable difference in the death-rate. It might account for some of it, but for the greater part the reason must be looked for elsewhere. The general officers never hesitated in time of battle to share the danger with the men whenever it became necessary. The gallantry with which they were wont to expose themselves is fully evidenced by the long list of those who were killed. There were also 23 Brevet Brigadier-Generals who were killed in action, but who were without brigade commands. They were regimental or staff officers whose brevets, in most instances, dated from the day they were killed. There were 35 general officers who died of disease during the war. Among them were several prominent and able officers-- Generals Sumner, C. F. Smith, Birney, Mitchel, Welsh, Buford, Corcoran, Ransom, Crocker, and other noted generals. A large number of brigades were commanded by Colonels, some of whom held a brigade command for a long time, during which they displayed marked ability, but without any recognition of their services on the part of the Government. The list of Brigadiers killed in action would convey an erroneous impression as to the losses in that grade,, unless accompanied by a supplementary list of the other brigade commanders who also lost their lives in battle. The following list is composed of Colonels who had been entrusted with brigades, and were exercising such commands at the time of their death. They were men of noble spirits, intrepid soldiers, whose gallantry and ability had won the admiration and respect of all. In each regiment there were officers whose duties did not require that they should go into action-- the Chaplain, the Quartermaster, and the Surgeons. Although they had no tactical position in the line of battle, there was a loss of life among their number which entitles them to some other place in the records of the war than that of mere non-combatants. Many of them waived their exemption from danger, and gallantly volunteered for service in the field; while others-- the surgeons, for instance-- attended calmly to the performance of their duties amid perils which would test the stoutest heart. Though the surgeons seldom took an active part in a battle, they were required to be near, and much of the time were under fire. Some of them went on the field with their regiments in order to render timely aid; others were stationed near by at some field hospital, where they often found themselves exposed to serious danger. During the war, 40 Surgeons were killed and 73 wounded while bravely attending to their duties on the battle field. They had not the excitement of the fight to dull their sense of danger; they had not the incentive of promotion; they were not spurred by ambitious hopes; victory might bring laurels to others, but not to them; they met their fate, actuated and sustained by no other impulse than the sense of duty. Many Surgeons died from disease while in the service, and their names also lengthen the Roll of Honor. A record of these patriots,-- their names and regiments, and the battles in which they lost their lives,-- appears in the Medical and Surgical History of the war. Several lives were also lost among the Quartermasters, some of them having been killed while serving as volunteer aids, while others fell while attending to the duties of their position when under fire. Among the first to scale the heights of Missionary Ridge was a Quartermaster-Sergeant of a Michigan regiment, who had borrowed a gun and volunteered for the fight. It will, doubtless, be a surprise to many to note the number of Chaplains killed in battle. These gallant members of the Church Militant were wont to take a more active part in the fighting than has been generally credited to them. They were frequently seen in the thickest of the fight, some of them handling a rifle with the skill of a marksman, while others, unarmed, would move about among their men encouraging them to do their best. In addition, there were several who lost their lives by the diseases incident to the hardship and exposure of a soldier's life. Chaplain Fuller, of the Sixteenth Massachusetts, had resigned from the service and had just received his discharge, when he learned that his regiment was about to go into action, at Fredericksburg. Crossing the river in the boats with the forlorn hope, he joined the skirmishers of the Nineteenth Massachusetts, who were then fighting their way through the streets. He fell dead, rifle in hand, in front of a grocery store on Caroline Street. Springer, of the Third Wisconsin, fell mortally wounded at Resaca, after having "seized a musket" and fought for four hours in the "hottest of the fight." Howell, of the Ninetieth Pennsylvania, was shot at Gettysburg during the retreat through the town, and died on the steps of a church. Butler was killed at the Siege of Suffolk, while carrying water to some wounded men. Bartlett, of the First Maine Cavalry, was killed at Cold Harbor. He was struck in the breast by a shell and "literally blown to pieces." Benton fell at New Berne, and General Reno states in his official report that he "was killed while nobly encouraging the men to do their duty." Eddy, of the Seventy-second Indiana, fell at Hoover's Gap, Tenn., struck by a cannon ball. Of Chaplain Ambrose, who was killed in the trenches at Petersburg, the regimental historian says that "a braver man never lived; a truer man never wore the garb of Christianity." At Resaca, among the Confederate dead which lay so thickly in front of the Twenty-seventh Indiana, was a family group: a gray-haired Chaplain and his two sons. The official reports make frequent mention of Chaplains whose gallantry and zeal had attracted the notice of their general. In the Chancellorsville reports, General Berdan, commander of the famous Sharpshooters, states that "Chaplain Barber, of the Second Regiment, took a rifle and went in with the skirmishers, with his usual bravery." At Antietam, Gen. J. R. Brooke mentions in his report "the brave Chaplain of the Sixty -sixth New York, Rev. Mr. Dwight, who was constantly in the field, in the thickest of the fight." Gen. Giles A. Smith, in his report of the battle of Atlanta (July 22d), states that Chaplain Bennett, of the Thirty-second Ohio, "carried his musket and fought all day in the ranks, which I learn is his custom on all such occasions." The officers of a brigade petitioned that Chaplain H. C. Trumbull, of the Tenth Connecticut, be brevetted a Major; stating that, "always at his post in time of danger, he has, on two occasions at least, displayed marked and conspicuous gallantry; dashing into the thickest of the fight to rally and encourage the wavering line." Gen. Terry forwarded the paper with the endorsement: "No officer of his regiment has displayed more gallantry in action, or done more to animate the men to do their duty." Aside from such notices, these men have not received the recognition due their services, but lack of space forbids further mention here. Many of the Chaplains had served in the ranks as enlisted men prior to their appointment. They were regularly ordained clergymen, whose patriotic zeal had impelled them to exchange their pulpits for the camp; so, when a vacancy occurred in the chaplaincy of a regiment to which any such belonged, the Colonel was very apt to recommend the clerical musket-bearer, whose gallantry perhaps had already attracted his attention. In this connection, mention should also be made of the many clergymen who left their pastoral duties to accept commissions in the army, some of whom held regimental or brigade commands. Among the brigade commanders killed at Cold Harbor was the Rev. Jeremiah C. Drake, Colonel of the One Hundred and Twelfth New York, an officer conspicuous for gallant and meritorious service on many occasions. A similar instance is found in the Confederate Army in the case of Bishop Polk, a corps-general, who fell while on the Atlanta campaign. The musicians formed a numerous class among the non combatants. Although their legitimate duty in time of battle was confined to that of stretcher-bearers, they often participated in the fighting. At Shiloh, the band of the Forty-eighth Ohio laid aside their instruments, procured rifles, and went into the fight, where two of their number were killed. Still, it must be confessed that the dead drummer-boy was not so common a feature on the field as might be inferred from the work of battle-field artists. The frequent loss of life among the stretcher-bearers attests the faithful work of the men employed in that duty, most of whom were musicians. At the battle of the Weldon Railroad, the ambulance train of the Fifth Corps lost 2 sergeants killed and 6 stretcher-men wounded: 8 horses were killed, and shells passed through two of the ambulances. This was not an uncommon experience. 1861-1865, Fox's Regimental Losses, Chapter IV. By William F. Fox, Lt. Col., U.S.V.